Amanda Boxtel featured in her exoskeleton suit. Meet the everyday hero, Amanda Boxtel, one of the top 10 CNN Heroes of 2018 and a resilient spirit who I had the fortune of connecting with at the CNN heroes event held at American Museum of Natural History, last month. She was a young athlete from Australia, before meeting with a skiing accident that left her paralyzed and unable to walk. 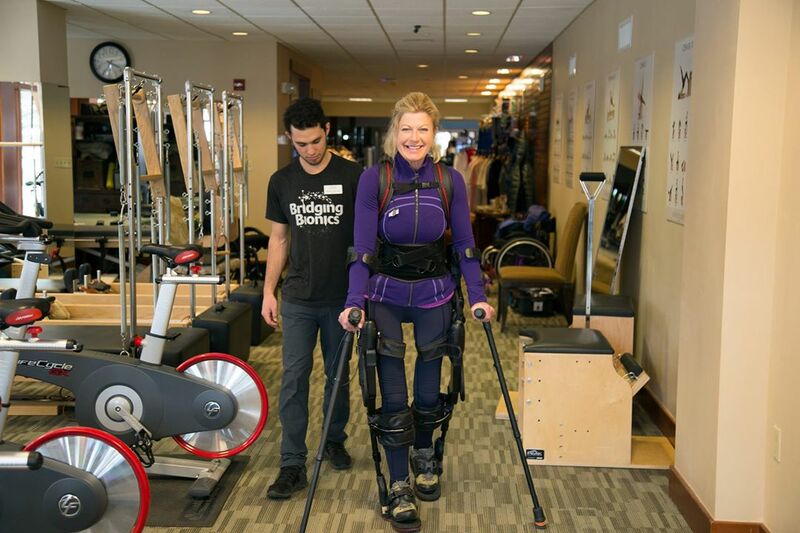 Today she is the founder of Bridging Bionics, providing low quality and free physical therapy technology such as exoskeletons to patients with mobility issues. What are your daily habits that have had a positive impact on your life after your accident? Rest in existence and find who you truly are -I remind myself of this daily. I’ve chosen to live a life in service to others. I will always have an indelible desire to give back and pay it forward. Living in the flow, in love, in gratitude and with kindness propels me forward, but it doesn’t happen without a daily meditation practice. In my morning meditation, I center myself and gift myself five, twenty, and sometimes an hour of precious Amanda-time to be quiet and calm. She emphasizes that we each have the potential within us to be a real hero through giving & acceptance. Amanda also maintains a routine of daily exercise- weight bearing on her legs along with fun & joyous activities with friends & family. What is a key piece of advice for someone going through a similar kind of journey? Prepare your body today to walk again tomorrow. While my spinal cord injury took away my ability to walk, it didn’t take away my ability to dream and then turn my dreams into my reality one baby step at a time. I knew I had to move my body or else I’d lose it.We weren’t made for a sedentary lifestyle. For anyone struggling through a difficult point in their life, she says we must first accept & then hope for a better life. A few years back I concluded that acceptance and hope must coexist. Acceptance and hope are polar opposites, yet they cannot be alive and present without each other. The alchemy of my pain, suffering, forgiveness, acquired wisdom, and aspirations melds to awaken me spiritually, emotionally, mentally, and physically. Hope for me has never meant passively sitting in my wheelchair and waiting for a cure to come along. Instead, it’s grown to mean taking the reins of my life, making critical decisions and sometimes, hard choices, and actively moving forward. Hope throughout my healing journey has meant improved quality of life, which is real and indisputable. Everything I do today, prepares me for what I will be tomorrow. Would I like to stand tall, slow dance, have a real heart-to-heart hug, climb a mountain, wiggle my toes in the sand and run on the beach? Yes. I would never deny myself that. Do I dwell on it and prevent myself from enjoying life and living it happily because I cannot right now? No. I believe this is the key to any life lived fully—accepting “what is” right now, while living with intention so I free myself for the possibility of what “could be” the next moment from now. What does being a CNN hero means to you? We all have a little ‘extraordinary’ in us. Through this journey, I’ve recognized that I am capable of tapping into my extraordinary traits, but sometimes those parts become dull and need polishing. We must rise to the occasion. If I can inspire others to tap into their unmet potential through sharing my journey, then I have met my goal. If I can do it, others can too. Being honored as a Top Ten CNN Hero has been the most humbling & transforming journey. I see the beauty that each of the 20 CNN Heroes of 2018 has brought to the world. We are truly humbled and grateful by your journey of overcoming & inspiring others. Poornima Peiris is an engineer interested in all things STEM related. She is the founder of an initiative encouraging women and minorities to pursue STEM related careers. She has conducted research in various stem disciplines at national labs and was a participant of NASA's space grant program. She is currently working on producing her own science podcast with her local community. Her scientific contributions include a publication in a scientific journal & besides reading up on scientific innovations, she also loves to read books on neuroscience, paint landscapes & create personalized wedding gifts. Aside from dabbling in the creative arts, she does fencing & tennis. Always a Sri Lankan at heart, she loves the ocean & spring weather. She currently splits her time between Massachusetts & New York.